Stan James Promo Code April 2019 | Bet At Stan James! Important: Stan James has become a part of Unibet and we suggest you visit Unibet to get access to their attractive promotions. What is the Stan James Promo Code 2019? Only new users who are making their first bet on the Stan James site will have the opportunity to take part in the Stan James sign up offer. 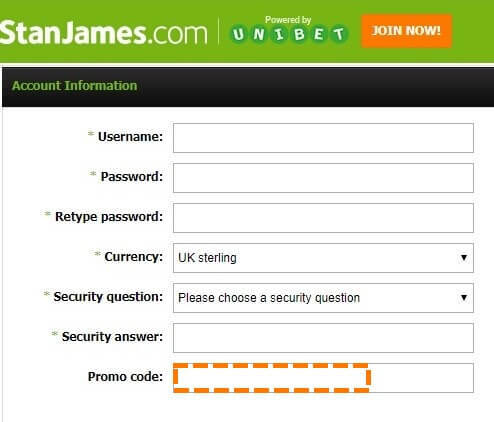 Users are required to register for a Stan James betting account before they may place a wager on the site. A Stan James promo code 2019 will not be required for this particular bonus. New users will be required to make the first bet on the site of at least £10 for the free bet bonus to activate. If a user doesn’t make a first bet of at least £10 the bonus will be forfeited. 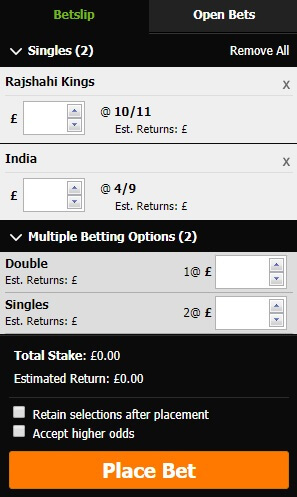 The qualifying first bet must be of odds 4/5 (1.80) or greater on a sports betting event of your choice. The £10 free bet will be credited to a user’s account within 24 hours of their qualifying bet being settled. A user will then have 7 days from that point to use the free bet. Not using the free bet within the 7 day period will result in the loss of the bonus. Read also: Win £30 in Free Bets With 888Sport Promo Code! Visit the Stan James website and click on the ‘JOIN NOW’ button found at the top of the homepage. You will be transported to a registration form which you will be required to fill out. The first part of the form will require your personal details such as Full Name, Date of Birth, Gender, E-mail Address and Mailing Address. The second part of the form will ask for you to create a unique Username and Password to login to your Stan James betting account. A security question and answer will also be required to further secure your account. The bonus code field can be filled out with a Stan James promo code 2019. However, for this particular welcome offer you will not be required to type in any Stan James promotion code. After you have successfully filled out all the fields click on the Terms and Conditions box and tick the ‘I am not a robot’ box’ before finally clicking on the ‘Create my Account’ button. Now that you have a running Stan James account you may make a deposit onto the site by visiting the cashier and using any of the number of payment methods. Lastly place a first bet of at least £10 with odds 4/5 (1.80) or greater on any sporting event you choose to activate the bonus. The bonus bet will then automatically be funded into your account within 24 hours. The simple and easy to navigate site ensures that new users won’t be lost as they search for their favourite sports to bet on. Since the Stan James layout is created specifically for UK-based bettors with all of the most popular UK sports such as Horse Racing, Cricket, Rugby, Football, Tennis and Golf available as quick links on the site’s homepage. Directly underneath is a full list of all of the sports provided by the site. A scrolling bar of all of the promotions and news for the site can be viewed down the centre of the homepage with a quick look at all the available live in play bets underneath. The main menu bar gives users the chance to switch between the sportsbook, the online casino, the poker room and even the new Bingo feature. Help can be found from the customer service team at Stan James at any point by simply clicking on the ‘Live Chat’ button found at the top of every page. To switch bet odds types click on the odds drop-down menu at the top of any page and select between American, Decimal and Fractional odds. The Stan James online platform may be accessed both through a browser-based client on computer or mobile as well as via a mobile app. The browser-based client is optimised on any mobile browser to give users all the same functionalities as the computer client all in the palm of your hand. The Stan James mobile application is available for iOS devices and has almost all of the same functionalities as the browser-based app in a compact design. Mobile registration, mobile cashier, mobile live betting and even mobile live streaming are all available when using the Stan James mobile app. As mentioned earlier, Stan James is known for providing UK bettors with all of their favorite sports. Football and Horse Racing are given special consideration at Stan James online, with multiple leagues and races from all over the world available for wagering. Bettors who are interested in American Leagues will be happy to hear that the NBA, NFL, NHL and MLB can all be wagered on at Stan James. More niche sports such as Netball, Hurling, Handball and Volleyball are also available for betting. If you enjoy the odd casino games then Stan James has you covered on that front as well with a fully stocked online casino featuring Slots, Table Games, Video Poker and even a Live Casino. Casino games come from some of the top software manufacturers in the industry such as NetEnt, Microgaming and NYX gaming. You can access the Stan James Casino with your Stan James betting account by simply clicking on the ‘Casino’ tab on the Main Menu bar. A number of secure and convenient payment methods are available for all UK-based bettors at Stan James. Deposit methods will instantly fund a user’s account whereas cash out methods may take 3-10 days to actualize based on the method prescribed. Stan James is a UK based bookmaker which has been running on high street for more than eighty years. The bookmaker recently entered into the online market backed by the Unibet Group in 2015 and is beginning to make its mark in the UK Online Betting Industry. The site currently offers some fantastic betting odds as well as one of the largest collections of sports and leagues among UK sportsbooks. The site also gives users the opportunity to take a break from the betting action and partake in a variety of online casino games, including live casino games. For users who tend to bet on the go a robust mobile app is available which is compatible with iOS devices. The trusted Stan James name coupled with the Unibet online know-how makes for a formidable team. The site features great odds and one of the largest sports collection available in the UK online betting market. By using the Stan James mobile app available on all iOS devices, users should have no issues staying on top of their bets and placing even live bets on the go, from wherever they may be. Special features such as live in-play betting, live commentaries, and daily tipping are added resources giving users all the extra information they need to place winning bets. Don’t forget the casino, poker room and newly added bingo room if you’re looking for some side action.